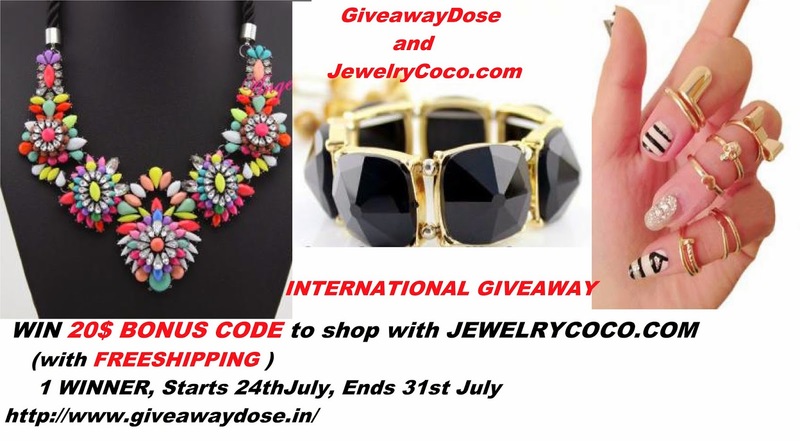 Giveaway dose: Win a 20$ COUPON from JewelryCoco.com with free shipping. Win a 20$ COUPON from JewelryCoco.com with free shipping. JewelryCoco.com is a leading China online wholesale supplier of Women's jewelry, Fashion Jewelry and Accessories, Men's jewelry. They aim to provide a wide range of high quality, trendy fashion jewelry at factory direct prices along with a professional service to customers all over the world. Thank you for tihis lovely giveaway! Thank you..i love this http://www.jewelrycoco.com/item-7636-Bohemian-Vintage-Gold-Choker-Chain-Neon-Bib-Statement-Necklace.html.